An app or game cartridge is crashing on my LeapTV, how can I fix this? Are any French titles available for LeapTV? Are game apps compatible between LeapPad and LeapTV? Are game cartridges compatible between LeapPad and LeapTV? Are Skype, Hulu, Netflix, or other apps available on the LeapTV system? Can children with physical disabilities play LeapTV games? Can I stream videos or music from the LeapTV system? Can I upgrade the memory on the LeapTV console? Can I use a computer monitor to play LeapTV? Can I watch DVD's, Blu-ray, or digital movies on LeapTV? Can the LeapTV console be laid on its side? Can the LeapTV console be set up behind glass in my entertainment center? Does the LeapTV system include a web browser? Does the LeapTV system support online multi-player? How can I purchase apps for LeapTV? How can I reset my LeapTV? How can I skip registration if I do not have internet available? How do I add additional player profiles? How do I add or remove digital content on my LeapTV console? How do I change the avatar for my child's LeapTV profile? How do I change the theme on the LeapTV Home page? How do I connect the LeapTV console to my television? How do I register my LeapTV if I skipped registration during setup? How do I remove the "Sneak Peeks" option on LeapTV? How do I set up Wi-Fi if I initially skipped Wi-Fi setup? How do I switch from an Ethernet internet connection to Wi-Fi with LeapTV? How do I switch from one LeapTV player profile to another? How long does it take for a purchased app or video to download to my LeapTV console? How long will batteries last in the LeapTV controller? How many unique player profiles can I set up on LeapTV? How much memory storage is available on the LeapTV console? Is a Wi-Fi connection required to use LeapTV? The edges of the TV screen are cut off, how can I fix this? The tether on my LeapTV controller broke, can I get a new one? What ages/grade levels are covered in the LeapTV curriculum? What do I do if I see “Unavailable” in the Registration screen on my LeapTV? What is included in the LeapTV box? What is the LeapTV registration code and what do I do with it? What is the maximum distance my child can be from the TV? What is the warranty period on LeapTV? 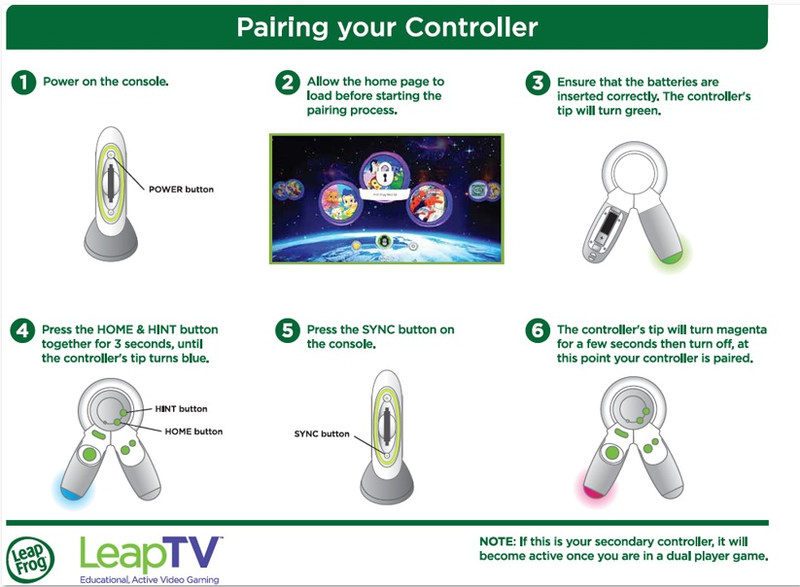 Which LeapTV games can be played head-to-head with two controllers? Why is the app I purchased taking a long time to download to my LeapTV console?